Hey Cloe - is that War and Peace that you are reading? I can't wait to hear how Doggie Daycare goes! Hi Chloe! Mom says that's how she read lots of her textbooks when she was in college. Perhaps that's why she doesn't remember a lot from some of those courses! You sure do look comfy! my name is Mona and i live in houston,texas with the Mommy. we were looking at "paw it forward" and since we like to keep up with all the dachsies (I'm a wirehaired dachshund) we wanted to stop by & say hello....HELLO. 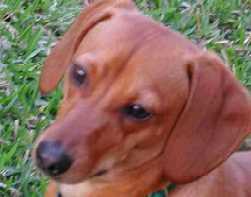 i see that you have the same dachsie friends that i have. Roxie, Sammy and Andy are my bestest friends and since we live in the same city & were all adopted from DROH we get to visit alot. I love to make new freinds so maybe i can be your friend too. I'm back live on the internetz!